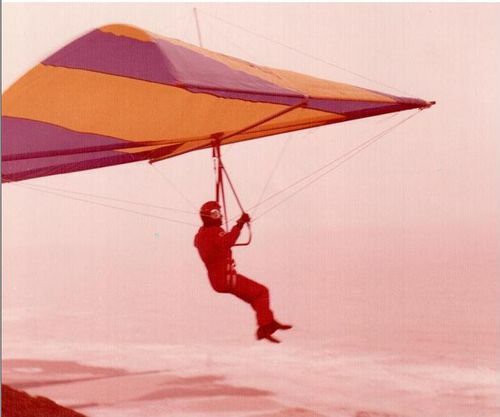 I was the sixth member of the Norfolk Hang Gliding Club. The very first time that I flew off Cromer cliffs my other half was waiting on the beach, I was wearing a pair of light trousers. When I did eventually pluck up the courage to jump off the look of horror on my wife’s face, she thought that I had cut my legs to bits, but what had happen is I had passed through a blackberry bush. What she thought was blood was really blackberry juice. I use to pay some young lads 50p to carry my kite back up to the top of the cliff until I converted a golf trolley, I could then take it up myself. It proved cheaper that way. I was once flying over Corton nudists beach when I lost the lift and landed among the nudists who came round the kite and started to ask me loads of questions. I began to feel a bit out of place me with my clothes on so I just stripped off and joined them, much to their surprise. A young lad who I worked with was interested in flying so I took him to Cromer with me. While I was flying I lost the lift and flared and, for a soft landing, I thought I would go into the side of the cliff but I landed in the middle of a gorse bush, up to my chest. It took the lad and some other passer-by nearly two hours to get kite and me out. Needless to say the young lad said that hang-gliding was not for him. He really did not know what he is missing. I am a keen photographer and wanted to have some footage while up in the air. I decided to fix my camera to the end of the wing of the kite and, to counter balance, I fixed a can of beer on the other end. After a very good flight I landed and, of course, just had to drink the beer. I once took my son on a 2up. His girlfriend kissed him as if it was their last kiss and by the look on my son face, drained of colour, he thought so too. I told my son to run and not to stop, true to my word he did keep running even when we where flying. When we came to land I unfortunately misjudged and landed in a rather large pool the tide had left. I told my son ”that’s your luck”. I had many happy hours in the air and made many very good friends. Hang gliding is one of the most exciting and pleasurable pastimes anyone could have.